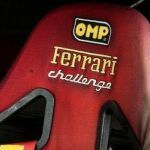 2018 the Ferrari Challenge celebrates 25 years – 1993 to 2018. The Challenge and GT Days are a private and special event for all generations of Ferrari Challenge and all Ferrari GT cars. Special groups of all other Racing Ferraris can join us and share the time and track with us (see groups and eligible Ferraris). The two days event will be at the fantastic Red Bull Ring in Austria. The Challenge and GT days are no RACE, so there will be no time keeping, it is rather a „come together” for friends and family without any noise limits. The number of participants is limited in all groups and therefore a selection procedure will take place based on the level of history, originality and condition of the car. Only completely filled out registration forms (incl. entry fee and picture of the car) that reach our office in time will be accepted. The organizers reserve themselves the right of a selection procedure based on the level of originality and condition of the car. Participation confirmations are sent afterwards. NOTE: If a participant will not be accepted, the entry fee will be fully returned immediately. Each additional person, mechanic or guest is EUR 250,- plus VAT and includes access to the track, catering service and the Gala evening. Cancellation: If you cancel your participation, the following conditions are applied: Cancellation until 1 April: 50% of the entry fee will be refunded. No refund after 1 April. On site will be a tire and race fuel service at your disposal. Where will it be and when? Keep us informed, good idea. Thanks for planning a great event for all Ferrari race car enthusiasts. I keep you posted, be sure we do something to bring the Community together. great, i will be there !!! !